In late 2011 into early 2012, while researching a piece on the local home brewing scene for The Philadelphia Inquirer, I attended 5 monthly meetings held by The Stoney Creek Homebrewers based in Collegeville, PA. Here is what goes on at any of their monthly meetings. They have since helped host The National Homebrewers Conference, which drew thousands to Philadelphia at the end of June. Club president Josh Weikert currently holds the lead for the Eastern Pennsylvania Homebrewer of The Year Award, an accolade recognizing year-long excellence which he won in 2012. Vice President Bill McGeeney is currently an assistant brewer at Round Guys Brewery, which Stoney Creek co-member Scott Ruddich launched shortly after the aforementioned Inquirer article ran in Feb, 2012. Another SCHB member, Erik Walp, has been an assistant brewer at Neshaminy Creek Brewing for the last year. 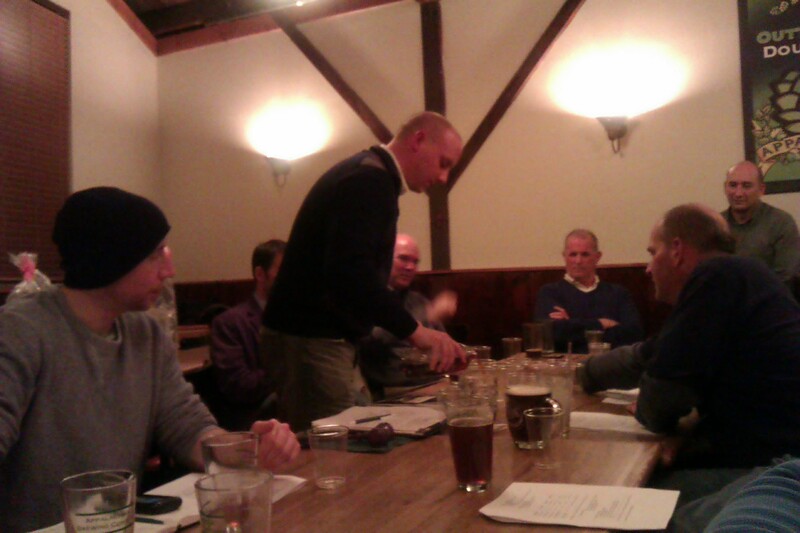 Club president Joshua Weikert came to The Stony Creek Homebrewers as many members have. His brother-in-law, Stan Belkowski, having piqued his interest with his own brew, helped him get started with his first kit. “My initial batch was okay, but not great. They gave me 5-6 things to fix and the next batch was vastly improved,” Weikert says. His current setup, he says, is a bit better. It’s mostly some countertop space in a corner of his garage that he uses. The night before their monthly meeting—held on the second Thursday of the month—it holds a few scattered bottles he’s just capped: Weikert’s first go at cider. He then walks me through the deceptively simple brewing process. One of many beers up for review at the monthly meeting. He went all-grain awhile ago, so he starts by dumping barley and hops in a five gallon cooler, to which he adds water heated to 152 degrees to get a fermentable ‘wort’. For the first year, like many beginners (and beyond), he skipped this ‘mashing’ step by using malt extract—either way, you’re supplying the sugar that the yeast will feed on ahead of yielding carbon dioxide and alcohol. “You save money and you get a higher degree of control—if there’s a mistake I know what to fix,” Weikert says, in regard to adding an extra hour and half to his process. After running through a filter, the wort is cooled, boiled to 212 degrees, and cooled again, leaving you with “sugars, alpha acids, and oils from the hops, which lend bitterness, flavor, and aroma ahead of the yeast being added for fermentation,” he puts it, with the confidence of a chemist. He does hold a professorship—but that’s in poly-sci. While SCHB, with a median age of around 36, does feature a high number of PhD’s and science professionals, Weikert says it’s hardly a requisite.